So you'd think with the extra 'warmth' layer I created from eating so much during the holidays I wouldn't be so dang cold at work. You would be wrong! So I've been trying to layer with some of my lighter spring and fall jackets as outfit pieces. And it works, kind of. The plaid compliments the jacket and adding a small striped pattern adds more interest. I can't believe this poor jacket has been waiting to be worn again for so long! Carrie from A Lovely Little Wardrobe is co-hosting today. Carrie has chic style and always looks so put together! 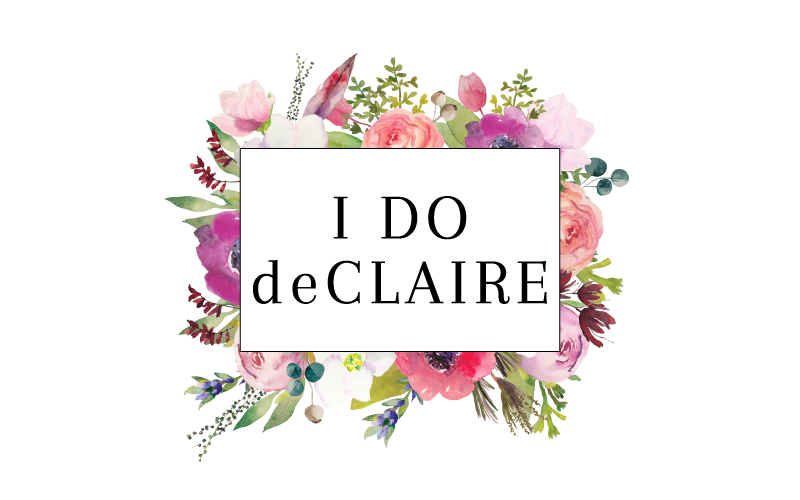 She is in the middle of a shop your closet challenge for the month of February she dreamed up called Create28 (what a clever name)! Every day has a different theme and lots of inspiration for outfits. 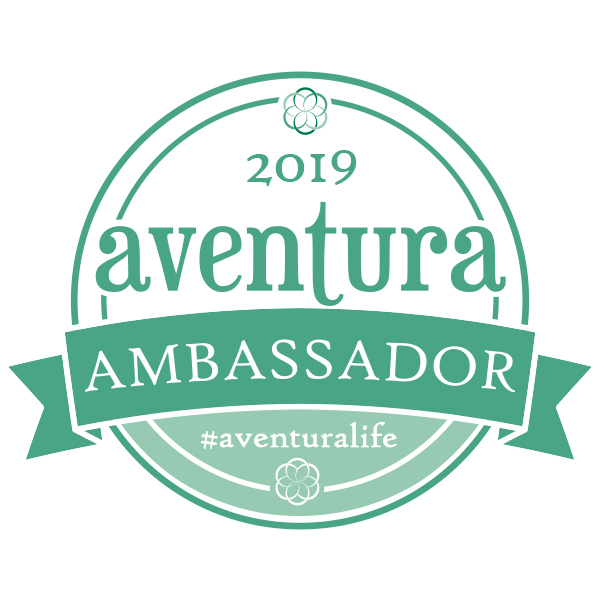 Make sure you go visit! That scarf is lovely, especially with your striped top! :) Hope it's keeping you cosy! it's funny, you're in winter gear and layering up and the most recent post I just linked up is all about summer and summer dresses ha! Thank you for the link up. I love the olive color of your jacket! The stripes and plaid combo is one of my favorites! The jacket and scarf go prefect together. Love this jacket and I want your tote! This look is perfection! You're right, the scar and jacket go together so well! Love the moto jacket, but I really need to compliment you on how perfectly you wrapped that blanket scarf. Looks great! This is the one winter I haven't cold, haha, thinking this baby belly has been insulating me a little. Typically, I'm the one who runs a heater in my office during the summer, always cold! Loving this outfit, the green jacket is different and refreshing! Looking gorgeous, Laura. Love that green moto! How cool! And still sorry I didn't grab that fab blanket scarf! Carrie is awesome .... great co-host! Hope you're having a wonderful week! That green jacket is so perfect with your blanket scarf. I love a structured jacket paired with a scarf but I'm really into the color of yours because it adds an extra element to it! You look great!!! I love that green jacket with the plaid scarf! So many fun colors! Love your green moto jacket, such a cool piece to have in your closet! That Scarf and jacket go perfectly together!!!! 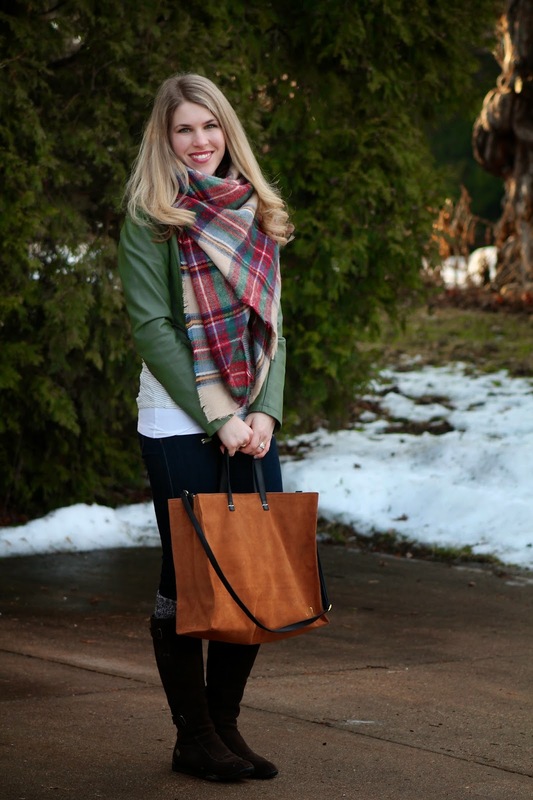 That scarf is indeed a great accent to this layered look! That is a such a pretty jacket and the scarf goes perfectly with it. Bummer that it didn't keep you warm enough. My clothes can never keep me warm. Sad face, right? I totally understand the winter struggle. That green moto jacket is beautiful on you and I really love how you're wearing that scarf, too!! The monogrammed bag is cute, too! Thanks for hosting! Love the scarf! I had to layer up today too since we've had snow recently. 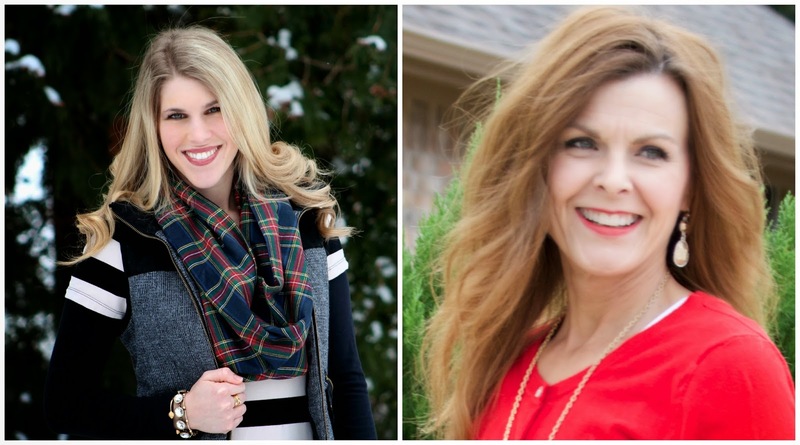 You and Kate both styled your blanket scarves with the most gorgeous, unexpected colors today! 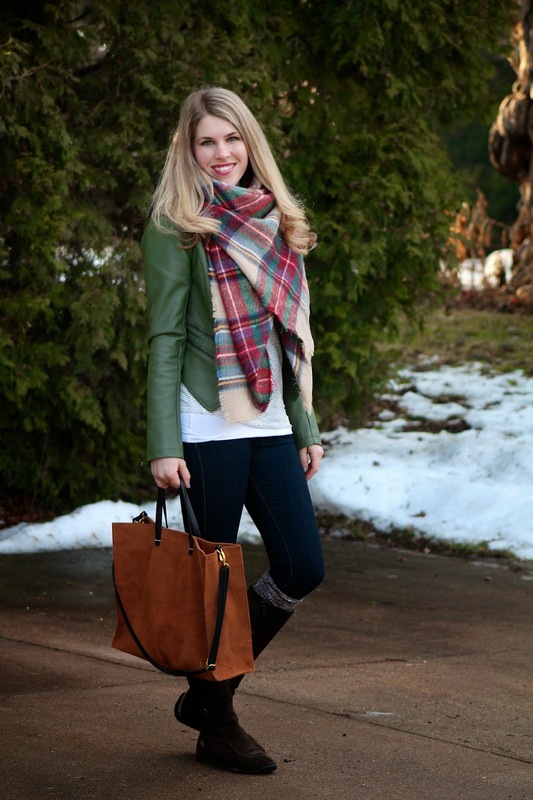 That leather jacket makes the green of the scarf pop and makes quite a statement! Cute outfit. Love your scarf. I have one just like that! Visiting from the Style Nudge! I'm in love with your green moto jacket! That forest green colour+leather is really unique and fun. Great scarf too! 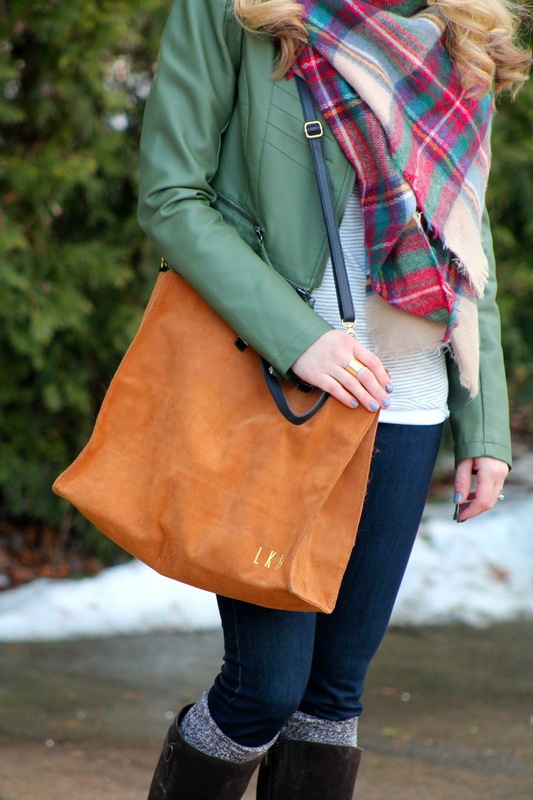 love that tote and the jacket is the perfect color to bring out the greens in the scarf. love it, stay warm! Definitely a cute combo, I definitely need some warmth here! You look great Laura. Love your green moto jacket. These days it feels too cold for life. I've been wearing scarfs as outerwear that I end up never taking off all day. Love the apple green jacket - gorgeous color. Crazy but we both wore moto jackets today! Love the color of yours and with the blanket scarf it's really pretty! Beautiful look, Laura! I love the jacket and that it's in an unexpected color. Perfection! I love the way the scarf pulls out the green from the jacket! A perfect match! I was just about to say the exact same thing as Kate--love how your jacket perfectly coordinates with your scarf! I like the subtle stripes layered underneath too. In love with your unique green jacket! Such an amazing wardrobe addition! WOW, what a gorgeous shade for a jacket, I so love it and it really pulls your outfit together! Beautiful! Love this look...this is something I could definitely recreate, but with my cargo jacket! (I just always struggle with tying a blanket scarf without it look like it's going to eat me lol.) You do it flawlessly! This is a great look you create! I still like your green motor jacket than the one I bought recently. Yours is more feminine. I love your layering! I've linked a similiar outfit - it works so well for me to layering to keep warm! 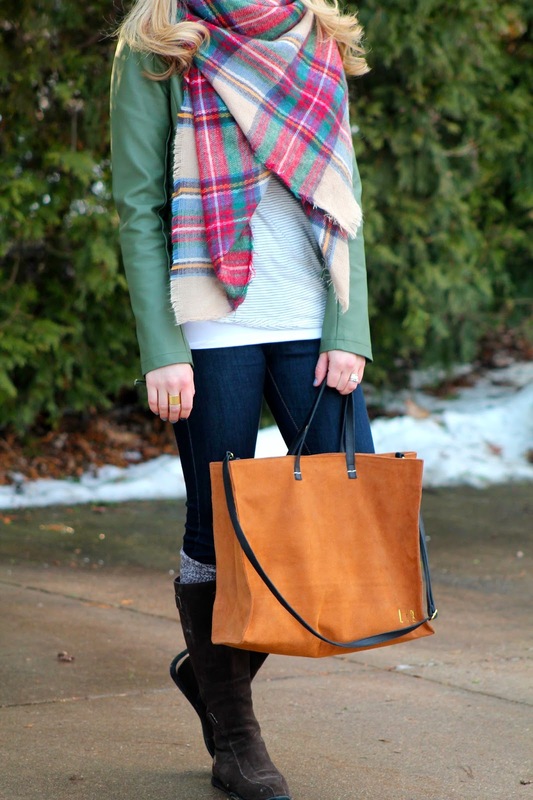 I love the green jacket -one of my favorite colors and that scarf is beautiful with the whole outfit! 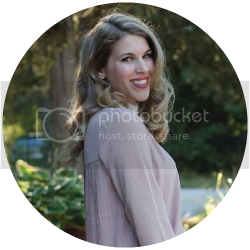 Thank you for your link up and for linking up with SHOE AND TELL on Style Nudge!! I'm not sure I'll ever be able to get over how much I love your green leather jacket, Laura! It's such a great shade of green, and would work well with all kinds of different colors and neutrals!